Welcome to the MOST OPTIMIZED control panel. It simply blows away the competition. 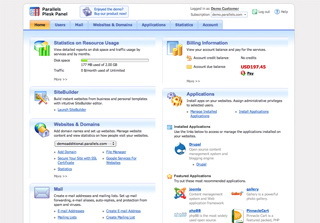 Parallels Plesk control panel allows you to quickly create and update websites, easily and add new services as your customer's needs change. Additionally, Plesk Panel allows you to manage service resources without having to learn any new skills. Plesk just works, right out of the box. Parallels Plesk Panel has role-based access (excellent for resellers), which allows administrators to specify which applications a user has access to. Additionally, recent performance improvements makes the Plesk control panel load faster, and also take much less resources then prior versions. Assignment of random default passwords and password strength indicators are just some of the recent security enhancements that have been added. Plus, the recent addition of FCGI support with Plesk Panel 10 further isolates sites in a shared hosting environment allowing greater account density and security than the traditional module approach. Have you ever wanted to automatically update multiple hosting accounts with a single click and ability to add multiple add-on plans onto one subscription? It is possible with Plesk license. No more manual work involved, just click and all your settings are applied, no matter how many or few customers you have. Parallels Plesk Panel license guarantee to meet all PCI compliance standards meaning that you can focus on your online business. With Parallels Plesk Panel 10 license you can now easily deploy your e-commerce applications, knowing that they will pass all PCI compliance scans.